As we strive to reduce our risk for heart disease (and our waistlines), we often forego some of our most beloved foods, like dessert! While this is a good strategy to follow most of the time (there are a lot of calories in dessert you know! ), there is no need to exclude desserts entirely from your life. In fact, rich, decadent desserts can fit into a heart-healthy eating plan, especially when a little culinary know-how and portion control is adopted. 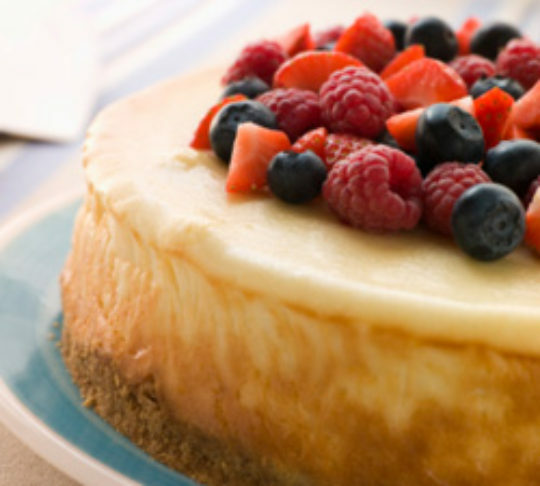 This cheesecake would be delicious set on a pool of raspberry coulis and topped with some fresh berries and a mint sprig. You may also choose to use low fat graham crackers in the crust. Needed: 1 pint (2 cups) non fat or low fat plain yogurt. Line a strainer with a coffee filter, cheesecloth, or paper towels and place over a bowl. Put the yogurt in the strainer and refrigerate for at least four hours or overnight. The longer the yogurt drains, the thicker the “cheese” becomes. Draining overnight will give you a soft cream cheese-like consistency. Yogurt cheese should be stored in the refrigerator and will keep for about a week. 1 pint (2 cups) yogurt yields approximately 1 cup (8 ounces) yogurt cheese. Adjust an oven rack to the middle position and heat the oven to 325 degrees. Mix the graham cracker crumbs, melted butter, and sugar together in a medium bowl. Transfer mixture to a 9” springform pan and press evenly into the pan bottom. Bake the crust until fragrant and beginning to brown, 8-10 minutes. Let cool on a wire rack while preparing the filling. Transfer the cake to a wire rack, and run a paring knife around the edge of the cake. Let cool until barely warm, 2 ½ to 3 hours, running a paring knife around the edge of the cake every hour or so. Wrap the pan tightly in plastic wrap, and refrigerate until cold, at least 3 hours, but preferably overnight. To unmold the cheesecake, wrap a hot kitchen towel around the springform pan and let stand for 10 minutes. Remove the sides of the pan and blot any excess moisture from the top of the cheesecake with paper towels. Let the cheesecake stand at room temperature for about 30 minutes, then cut into wedges.